Outside a shoe store in broad daylight, on a nearly cloudless day, in the town of Bennington in Vermont in the year 1970. I was with a young woman at the time that was outside the store, while my parents were shopping in there. There was no sound from the disc at all. 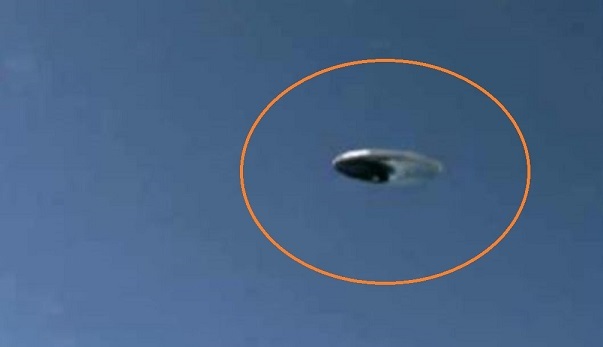 When we first noticed the object, it was just hovering there in the sky about six hundred feet away, and about one hundred feet off of the ground. It started to move in a slow and straight motion to my left. The sighting was an interest that invoked curiosity and wonder at what it was that we were witness to. I mentioned to her to go and tell everyone in the shoe store to come out and to see this. The disc shaped object exited the sky in a display of non ballistic motion before anyone else could arrive. My father was a prominent university theologian that was the author of several books that focus around psychic phenomenon, and classified government research. There was no mistaken idea as to what it was that the two of us were seeing on that day in broad daylight. It was a positive experience that was without fear or apprehension as to what it was that we were witnessing. A miracle with a divine providence was what it was that we had seen that day. I have watched the government of this country ensure the security of information and unusual phenomenon that is supported by a use of lethal force. The reciprocity from me was one of being perplexed, and I gathered that a mandate of very stringent conditions of containment in access to information was being implemented by the Department of Defense. I never saw the occupants of the UFO, since the age level precluded my ability to assimilate the ‘who,what,when,and where’ to a greater degree. I have watched other good men and women pay a high personal cost in order to become the victims of those that want to control the telepathic influence of these beings. This stands in contrast to being a part of the solution in society that is directed towards an understanding as to why these intelligent life forms that are from other planets are visiting the Earth. NOTE: The above image is real and was witnessed 1-17-13 in Palm Harbor Park in Florida. This case is under investigation by Chief Investigator ken Pfeifer of MUFON Vermont. I simply want to mention I am all new to weblog and really savored your website. Almost certainly I’m going to bookmark your website . You definitely come with incredible articles. Appreciate it for revealing your blog site.